They looked like little old ladies. Shrivelled up and smaller than before, when they were all plump, pretty and glowing. Now the glow is softer, more subtle, coupled with a flavour pared down to it's intense best. I'm talking roasted tomatoes. Roasted anything for that matter. I mean just take beetroot. Lovely when boiled, eaten plain, with a grinding of salt (and a lick of mayo if you share TheHusband's deviant tastebuds). But just try them roasted. Add a swirl of oil and balsamic vinegar and some oventime and man, you've got a tongue party just waiting to happen. Yes okay, so I'm slightly obsessed with beetroots. But the tomatoes. We were talking about them when I got so terribly sidetrack. To sum up: roasting = a very good thing. A very good thing indeed. Frankly, the slower the better, but I'm guessing you're probably like me in that you don't have time waiting around for hours for a tomato to roast just so when all you really want to do is gobble up a plateful of instant noodles pasta for supper. So we compromise. A shorter, more intense roasting, but (almost) equally flavourful. Jammy. I love that word. Jammy goodness. 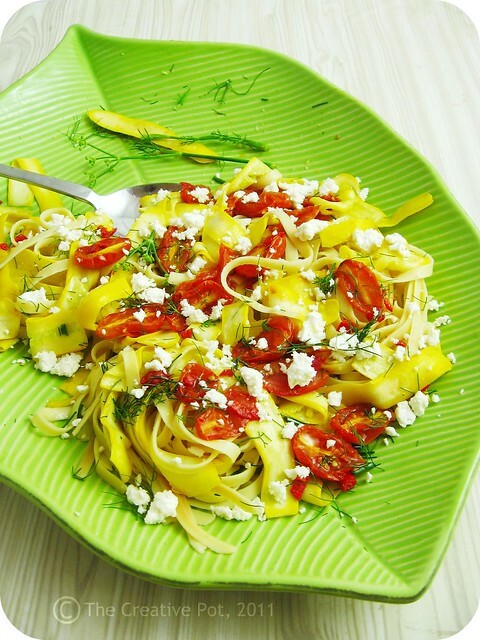 Toss 'em together with some silky-chewy tagliatelle, lemon-y yellow ribbons of zucchini (aren't they pretty? ), fresh dill from your own garden (cue smug smile), and some chopped up chilli for kicks. Now all you need is some perfectly firm-yet-crumbly feta and you're set. Supper on the table in 30 minutes. Now that's what I'm talking about. 1. Spread the tomatoes out onto a baking tray, then roast at 180C (350F) until slightly shriveled and jammy. 2. Meanwhile, boil pasta in a big pot of salted water until al dente. 3. When the pasta is almost done, heat half of the oil in a large frying pan and add the zucchini ribbons. Cook, stirring, until just softened - don't cook any further or it will become a mushy tangle. 4. 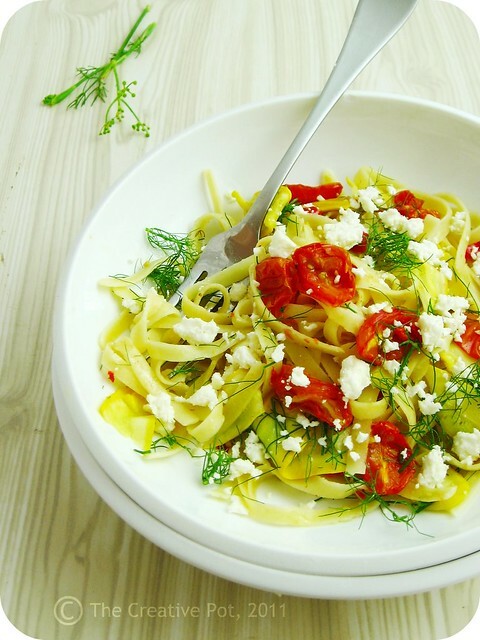 Gently toss zucchini and tomatoes into the cooked tagliatelle, adding the remainder of the olive oil, lemon juice, chillies and fennel. Add salt and pepper, then spoon into serving bowls. Crumble feta over the top and serve immediately. I love how simple, tasty and healthy this pasta is. I love a thick, creamy sauce as much as the next foodie but sometimes, when you have that veggie craving, you need something light. This hits the spot. OK, THAT'S IT! The next time I'm in South Africa, you are going to show me how to take gorgeous photos such as these ones! I won't take no for an answer. Your photos make me want to lick my screen. Love the brightness. Love the burst-in-your-mouth goodness that baby roast tomatoes hold. I totally agree with Kitchenboy, all the tinkering in the world isn't getting me to your standard, i demand classes! @Delices - Oooh that's a great tip for slow roasting tomatoes. I'll be trying that out soon! I'm pretty sure that the intense flavor of roasted tomatoes could turn even the most vehement tomato-haters into addicts. This pasta dish is gorgeous! Ooo . . . this looks so delicious. And reading your description of roasted tomatoes while I am hungry really is cruel. I've never roasted tomatoes before, but it sounds like something I should try and soon! Thanks for the inspiration! Lady, your writing is delicious, it sounds like a poem wrapped in bacon and chocolate (separately) and dancing in my head. I'm not sure whether to stand back and appreciate it, or gobble it up without thought. beautiful space you have here :) First time in your blog and this dish is looking mouthwatering tasty. I am a pasta fan and i like zucchini and how can someone not like fennel .. GORGEOUS! Following you in twitter now . What a gorgeous, colorful dish. Sometimes simplicity gives the best results. This is so beautiful! I'm totally with you on the roasted veggies fan club. Roasting anything makes it insanely delicious, and it's actually a pretty healthy cooking method. Win-win! I have missed popping in to your blog. You have covered all my weaknesses: pasta, tomatoes, feta, baby marrows.